Blade length: approx. 32-34 inches. Grip: ivory or bone with brass or copper twistwire. Scabbard: Black leather with gilt brass mounts. It is likely that they were being worn before this time as stirrup-hilted swords, both in the Army and Navy, were very popular at this time. 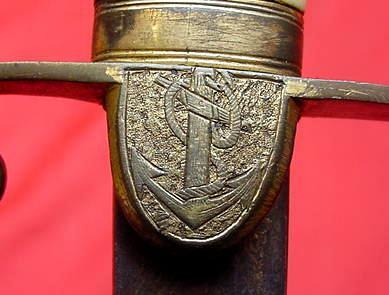 The major change in design appears to be the move from a plain, stepped pommel to one that features a lionshead. Swords worn by commanders and above had an ivory grip, with black fishskin for lieutenants. Blades for senior officers were also heavily decorated in blue and gilt designs, including naval trophies, masts, anchors and flags. 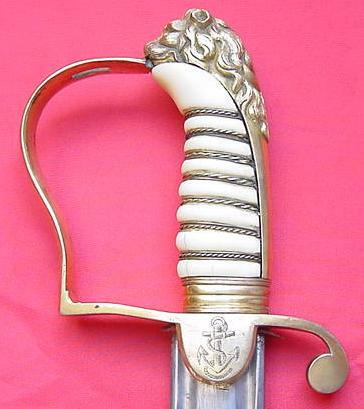 A regulation straight, cut and thrust blade, very much like the version carried by infantry officers, is the type most commonly seen, although there appears to have been a tradition with naval officers to carry broadsword blades. They were probably old family blades simply attached to the new 1805 Pattern hilt. Very few blades survive with their decoration intact and many are found very worn and pitted, lacking the original scabbard. The negative effect of saltwater on these blades is a strong factor in their condition. It is a great shame as the few complete pieces that I have seen are tremendously decorated, and the effect of the ivory grip, blue and gilt blade, with companion gilt brass and black leather scabbard, is truly superb. This pattern of sword is relatively scarce and finding original examples is difficult - blue and gilt blades are virtually unheard of in the current market. Most are also without scabbard. In recent years, fakes have been produced in India.